Fernanda Sibilia brings the flair of traditional Latin American handicraft to her hand-hammered metal pieces. Hailing from the home of the tango, Argentinian jewelry designer Fernanda Sibilia brings the flair of traditional Latin American handicraft and culture to her rustic, hand-hammered metal pieces. Her bold yet elegant jewelry is equally inspired by ancient metalworking techniques as well as the ornate fileteado porteño style native to her Buenos Aires home. To make this sculpural necklace, she deftly shapes brass threads into delicate rings of varying thickness and then electroplates select pieces with lustrous gold and warm copper. She then lets the magic of oxidation give select rings a one-of-a-kind patina that varies in hue from dark umber to creamy sea green. Handcrafted in Buenos Aires, Argentina. Make it a set! Pair with the Trio Mixed Metals Earrings. Buenos Aires offers many layers of inspiration—natural, architectural, and cultural—for Argentinian jewelry designer Fernanda Sibilia. Her rustic pieces embody the spirit of her city and capture the flair of traditional Latin American handicraft. Wielding a hammer, she deftly bows sheets of metal into sinuous threads and gleaming rounds. She highlights subtle colors by electroplating select pieces with lustrous gold and copper, or letting the magic of oxidation give strands one-of-a-kind patinas that vary in hue from dark brown to creamy sea green. Visit our blog to learn more about Fernanda's work. Avoid direct contact with water, excessive light or heat. After each use, gently wipe with a soft cloth and store in a jewelry box or in a fabric pouch. This is a gorgeous piece to be worn for every day and every occasion! 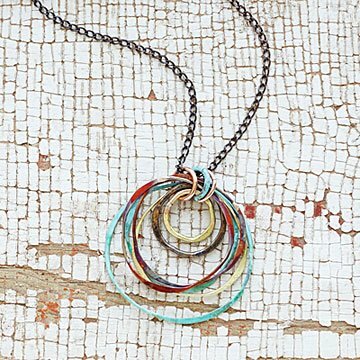 Fun and versatile necklace for any age! This is very pretty. It looks just like in the photograph. Recipient was extremely happy. This necklace is beautiful and versatile. It's very stylish. I exchanged this item for an item I was gifted. I love unique necklaces and this fits the bill. I'm a bit worried about the clasp -- I've never had an open clasp and I'm worried I'll lose the necklace. I saw this necklace in a UG catalogue and fell in love. My husband figured out that the giant, heavy Sharpie circle on the page meant, "BUY THIS!" It's gorgeous--earthy and delicate and striking and ethereal. Even the clasp is unique. Kudos to the artist. Very easy to clasp. Lots of compliments when I wear it. I love the mixed metals. It is very versatile-goes with a lt of outfits.